STAR POWER: Wakamatsu-san and Nakamura-san talking shop. Want to enjoy some honkaku shochu in the Harajuku/Omotesando area of Tokyo but can’t stand cigarette smoke? OnJapan Cafe has you covered. The shochu selection isn’t exhaustive, but the quality is high, and the atmosphere is perfect for couples and small groups alike. 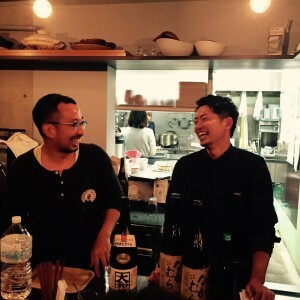 And the venue has been known to host shochu tastings, the most recent of which invited two of Kagoshima Prefecture’s most sought-after distillers, Tekkan Wakamatsu and Shinya Nakamura. 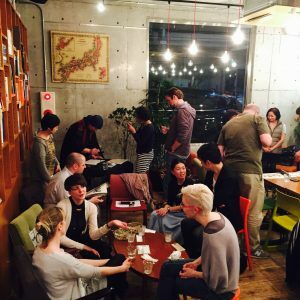 Saturday April 9th was the first of what looks to be an ongoing series of distiller-led events at OJC, and you should bookmark Shochu Pro’s events page if you want to be one of the first to know about what’s scheduled next. Several varieties of single-distilled sweet potato shochu were available for guests to enjoy, and the crowd of 35 managed to drink its way through nearly the entire stock in a little over two hours. Guests were greeted with a welcome drink and then started in on a small plate of appetizers as Nakamura Distillery’s Shinya Nakamura talked about his brewing operations and premium shochu in general. Two of the best handmade shochu from Kagoshima Prefecture headlined the event in Tokyo. Nakamura-san spoke of the uniqueness of premium shochu and Kagoshima Prefecture’s role in distilling in Japan. 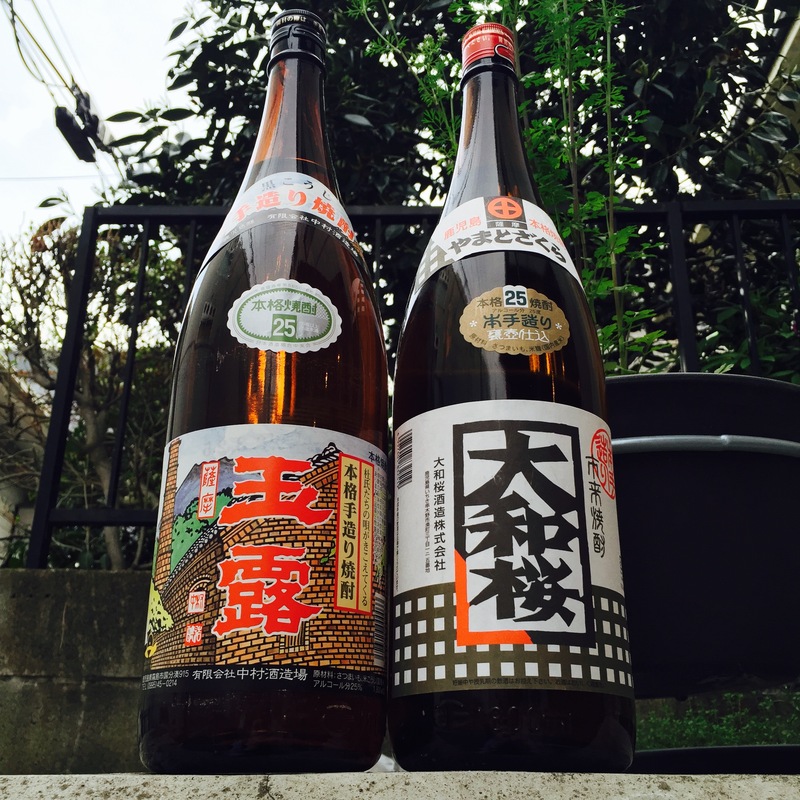 Yamato Zakura’s Tekkan Wakamatsu followed with details on the generations-old “craft” nature of the few remaining handmade shochu distillers in Kagoshima (both Yamato Zakura and Nakamura distilleries create premium handmade shochu). He spoke passionately about how spirits made using locally sourced and simple ingredients in small batches, and distilled just once in a pot still are exceedingly rare worldwide. Because multiple distillation is not allowed in honkaku shochu production, even small problems with the ingredients or brewing techniques will create off-flavors in the final product. Consequently, Wakamatsu explained, the freshness and quality of the ingredients used are paramount. Other topics discussed included how to tell the difference between shochu and sake if you can’t read the label (hint: check the alcohol percentage–shochu is almost always bottled at >20% ABV). Tekkan Wakamatsu discussed differences in aging techniques, and both distillers showed brief videos which clearly portrayed the manual labor undertaken by the folks who choose to make shochu by hand. Sakaguchi Sensei painted personalized calligraphy for guests throughout the event. After a brief Q&A, guests were able to talk shochu with the two master distillers as they poured dozens of drinks from behind the bar. Meanwhile, Sakaguchi Sensei, an accomplished calligraphy artist, performed in front of the library. He often has his own events at OJC, so keep an eye on their calendar for future calligraphy workshops. More than half of the guests left the event with artistic representations of their names painted in a calligraphic style. The two featured guests made sure to add additional drinking styles to the more common oyuwari, mizuwari, and on the rocks options. Wakamatsu-san force-carbonated his own soda water behind the bar and created light sweet potato cocktails for guests to try. Nakamura-san made an avocado appetizer that paired perfectly with the Nakamura and Gyokuro sweet potato shochu that he was pouring. The star power of Tekkan Wakamatsu and Shinya Nakamura brought guests from across Japan as one shochu-lover flew in from Fukuoka, and another devoted one evening to the event during her one week trip from the United States. 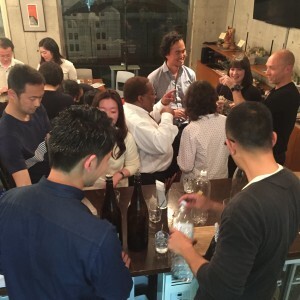 Asked what was most interesting about this type of casual tasting, both Wakamatsu and Nakamura remarked that it was surprising how happy the international guests were to follow recommendations for how to enjoy sweet potato shochu. Kagoshima residents often cut their sweet potato shochu with hot water to help bring out the bouquet, but this drinking style is rarely recommended to people new to the drink. Guests drank through two 720 ml and five 1.8 L bottles of sweet potato shochu. The OJC guests, however, no matter where they hailed from, commonly asked the distillers, “How would you drink it?” Nakamura-san in particular was impressed by how flexible everyone was when it came to trying something new. This was especially true for the non-Japanese contingent which made up roughly 40% of the audience. Despite featuring the sweet potato products of just two distilleries, guests were presented with enough diversity for them to pick their favorites. Some opted for the slightly sweeter purple (beni) sweet potato product from Yamato Zakura while others preferred the nuttier Nakamura label. Wakamatsu and Nakamura were also highly enthusiastic about the opportunity to test their message and story on a more international audience than is normal at tastings in Japan. They represent the next generation of distillers, and they are under no illusions about the necessity of reaching abroad to educate consumers and create new markets. Hopefully more distilleries across Japan will follow their lead and help shochu (and awamori) become a household name internationally.